Melt Stability is performed to measure the thermal stability of a material at a specified temperature and shear rate. It can be a good indication of how stable a material will be if it is allowed to remain in a piece of equipment at elevated temperatures for extended period of time. Such scenarios could occur during changing of molds on an injection molding, replacing a breaker plate on an extruder, or other machine equipment malfunctions. 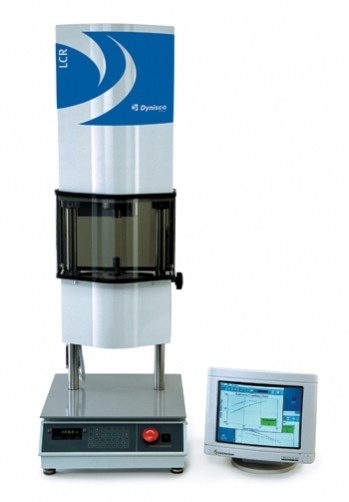 Melt Stability is performed using a Capillary Rheometer. The instrument is equilibrated to a specified temperature (for example, 250°C for HIPS formulations) and shear rate (500/s). The selected temperature should be close to representing an upper processing temperature. The selected shear rate should be close to representing a typical shear rate that the material will be subjected to during processing (500-1000/s is typical for twin-screw extrusion). The Capillary Rheometer is programmed to allow the material that is placed in the barrel to equilibrate for 6 min, at which time the piston will travel a certain distant, pushing material from the barrel through the orifice at the selected shear rate. The viscosity of the material is measured and the material in the barrel is allowed to sit at the specified temperature for a given amount of time (6 minutes). Again, the piston will travel a certain distant, pushing material from the barrel through the orifice at the selected shear rate. The viscosity of the material is measured and the material in the barrel is allowed to sit at the specified temperature for a given amount of time (6 minutes). This process is repeated for a total of five measurements, which is more than 30 minutes of testing time (holding and measurement time). Capillary Rheometry measures apparent viscosity (resistance to flow) over a broad range of shear rates and at varied temperatures, which are comparable to the conditions encountered in molding, calendaring, extrusion, etc. The data is commonly used to determine processing parameters, for lot-to-lot quality control, to measure processing degradation, which could reduce physical properties, and to study thermal stability. According to customer specifications, temperature, shear rate and other parameters are selected. In a Shear Sweep melted plastic is extruded through a capillary and the force at varied shear rates is determined. To determine Thermal Stability, melted plastic is extruded through a capillary after varied periods of residence time in the barrel of the extruder. At least 30g of material are required. In a Shear Sweep, shear stress and shear rate are calculated and plotted. For Thermal Stability, apparent melt viscosity is calculated and plotted versus residence time.